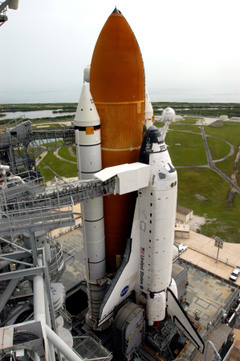 Yesterday NASA announced that it will delay launching the shuttle Atlantis until at least January 2nd. Atlantis was supposed to take off on Thursday, but one of its four fuel sensors started malfunctioning prior to the flight. For now engineers are going to try to fix the problem while the shuttle in on the pad, but if they can't figure out the error that way, they'll have to move Atlantis to the hangar, which would cause further delays. The good news, though, is that the agency says there's still enough of a time cushion to keep its February launch, which includes parts of the Japanese Kibo module, on track. Did someone forget to tell them to halt this? read the article, dude. It says payout will happen on January 1st regardless. I like when ambition is the flame that lights the life of so many people, who are working together to obtain such a enormously amazing result. Bad weather is always a hassle for this takeoff missions. maybe NASA should rethink their launching destinatins. this is my dream to see earth outside the space. Launching a shuttle is expensive, so better make sure that everything is under control. So that no one will suffer.